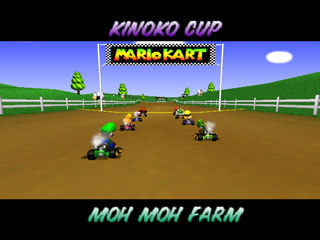 When the Mario Kart 64 title screen appears, each version has a different welcome message. Mario greets you with "Welcome to Mario Kart-a!" 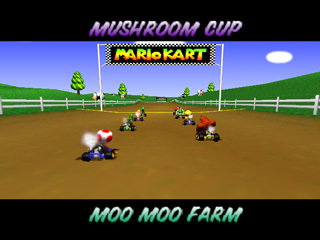 in the U.S. version, which replaced a group of kids yelling "Mario Kart-a!" in the Japanese version. Sound clips are provided below. The same voice clips are played again before the credits sequence, when no background music is playing. 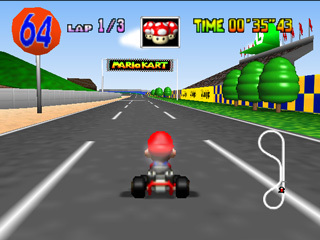 You can hear the BGM-free versions on our Mario Kart 64 sound clips page. Both versions have an announcer who helps guide you through the pre-game setup screens. 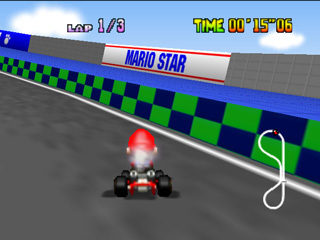 The difference is that the Japanese version has a very American-sounding announcer with a voice that echoes, while Mario lends his voice to the U.S. version. Check out the MP3s below for a comparison. The comparison above hints at another audio change: Luigi, Peach, Toad, and Wario have different voices in the U.S. version. The following voice clips compare what the characters say when selected on the Player Select screen. 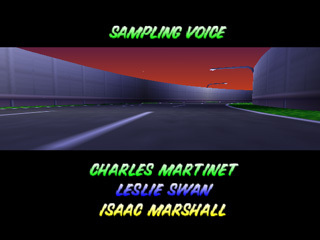 Visit our Mario Kart 64 sound clips collection for the rest of the driver voice clips from both versions. Thwomp's laugh was created by taking Wario's laugh and slowing it down. Since Wario's voice was changed, Thwomp's laugh changed along with it. 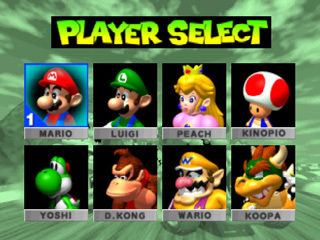 In both versions, the beginning part of Wario's "Player Select screen" laugh was used for the Thwomps. 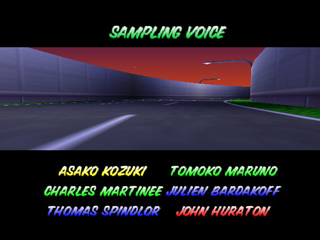 Note that there are six people credited for "Sampling Voice" in the Japanese version, but the U.S. version lists only three people. Charles Martinet is the only person credited in both versions. 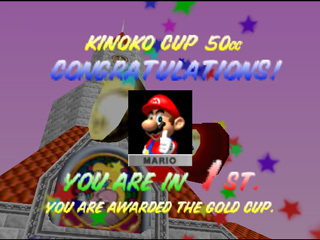 As always, "Kinopio" changes to "Toad," and "Koopa" changes to "Bowser" for the U.S. version. "D.K." was originally abbreviated as "D. Kong" in the Japanese game. Also, the lettering on the name labels is slightly bigger in the U.S. version. Out of all the "advertisement" signs, the only one that stayed the same was the "[Shell] Shot!" sign. 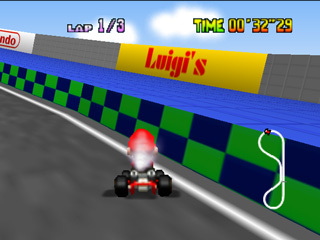 The following comparisions are from Luigi Raceway, but the signs appear in several courses. 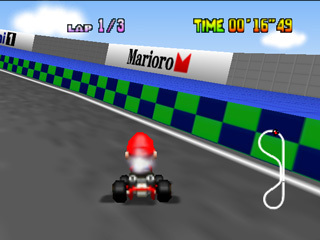 The "Marioro" sign (a nice parody of the Marlboro logo) was changed to "Mario Star." 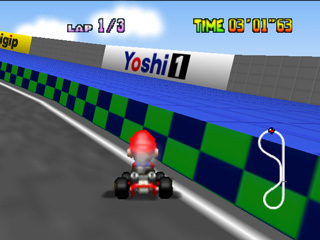 Another clever parody is the "Yoshi 1" sign, playing off of the Mobil 1 logo, red "O" and all. 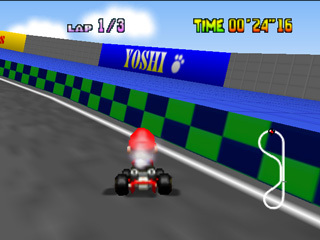 The U.S. version has a "YOSHI" sign with a paw print. 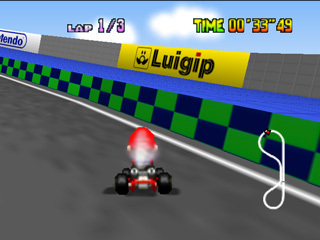 The "Luigip" sign is an imitation of the Agip logo. It was changed to "Luigi's" for the U.S. version. 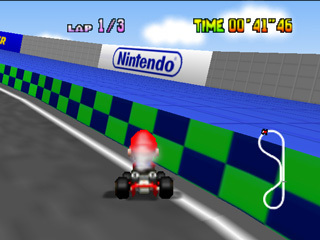 The Nintendo logo was changed from blue to red. You'll usually see the same change on Nintendo games' boot-up screens. 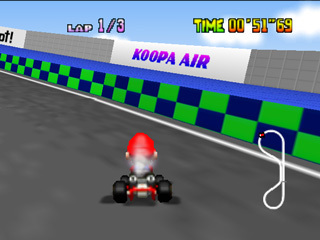 The "Koopa Air" sign remained, but the colors were changed. The blue and yellow sign in the Japanese game is a parody of Goodyear's logo. 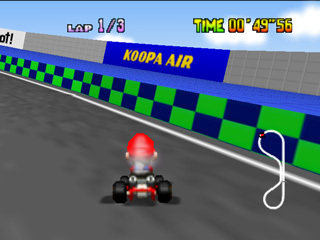 Only found in Luigi Raceway, the orange and blue "64" ball, a takeoff of the 76 gas station ball sign, was changed to blue and white. 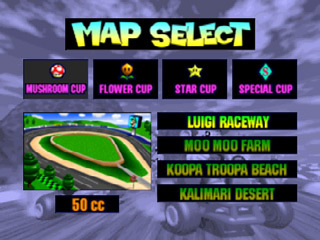 Despite the color change, the Luigi Raceway picture used on the menu screens still has the orange ball. The Japanese game provides "Moh Moh Farm" as its own translation for the Moo Moo Farm course. Mooing in Japanese is "mō mō," which sounds like "moh moh," and this is one way to romanize the Japanese long "O" sound. 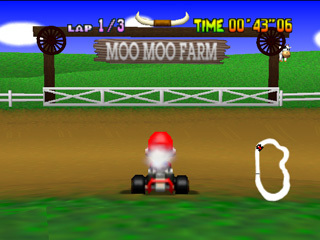 The farm's sign, which appears twice in the course, was remade with slightly taller letters. 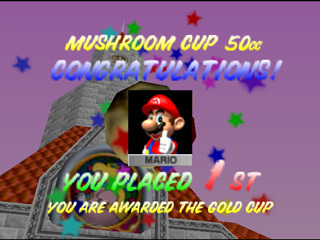 During the trophy ceremony, the game tells you what place you finished in, even if you didn't earn a trophy. The text "You are in" was changed to "You placed" and the period was removed after the ordinal number. The sentence that appears when you earn a cup also lost its punctuation. 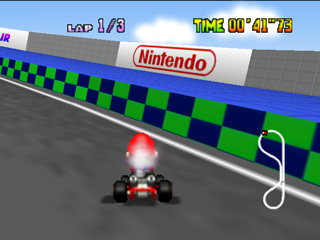 Though the Japanese version has translated character names on the Player Select screen, the names are shown in Japanese on the race results and time trials records screens. D.コング D. Kongu D. Kong D.K. It turns out that the translations provided by the Japanese game match up fairly well with our translations in the chart below. There are only two differences: In the game, Moo Moo Farm is "Moh Moh Farm," and Hyūdoro Pond (Banshee Boardwalk) is "Hyuudoro Lake." The Japanese version never shows the Cup names in Japanese script.